Pensacola Beach Yacht Club (PBYC) can trace its humble beginnings to a fun-loving group of boat owners who, in the late 1970's either docked or lived aboard their boats in the only wet-slip marina on Little Sabine Bay on Pensacola Beach at the time. The Marina, as it was known then, also had a full service restaurant and nautical-themed bar, the Hookers Nook. It was there, watching the sunset, or sipping a cool one by the open-pit fireplace inside the restaurant that "impromptu camaraderie" evolved into discussions of forming a yacht club. Ron Weidler, a live-aboard, was elected the first commodore in 1980. 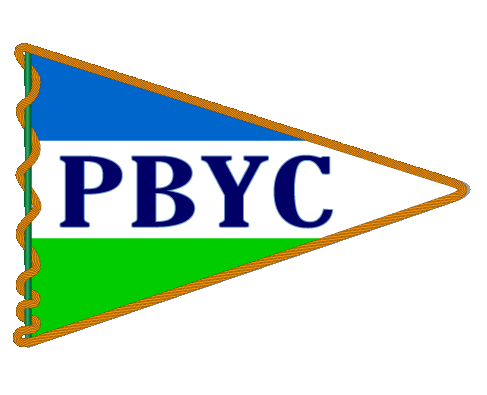 PBYC was incorporated in September 1982. Debates of "whose boat is faster" are typical sailor banter and were the basis for the club's first official race. It was decided to race out to the Sea Buoy (in the Gulf of Mexico) and back, a distance of about 22nm. Whoever returned first would be declared the winner and would have "bragging rights" as the fastest boat. The race became known as PBYC’s Big Mouth Regatta. With a racing program established and incorporated into the Pensacola Bay schedule shared by two other yacht clubs, PBYC members wanted more. A monthly "Moonlight Madness" race series during the full moon was begun for those who wanted to test their skills against dark skies and fickle winds. When it was decided to join the annual Pensacola Beach Mardi Gras Parade, PBYC adopted the name PBYC Krewe of Moonlight Madness. The first year, members hopped into the back of a pickup truck and wore foul weather gear as costumes. For several years, the float has been a boat with theme changes yearly. One year PBYC won the "small float" category prize. Held annually in February, the parade attracts thousands of tourists and residents. By 1985, the club endorsed the "adopt a bar" concept as the official meeting format. Once a month, on a prearranged basis, members of the rapidly growing club would meet in a rotating series of local bars and restaurants for happy-hour prices on drinks and hors d'oeuvres. This benefitted beach businesses, and provided new experiences for members. Establishments included Bogie's, The Islander, Dirty Joe's, The Player's club, The Sunset Lounge, LaFitte Cove, Sun Ray, Shanahan's, McGuire's, Jubilee, Moorings, and Sandshaker, just to name a few. PBYC created a Building Fund in 1986 with the purpose of building its own clubhouse. Beginning in 1988, PBYC began renting clubhouse space on the island. The first rented space was The Hookers Nook at The Marina (1988), followed by a 900 sq. ft. unit on Quietwater Boardwalk near Bamboo Willie’s and Hooters (1989). In 1993 the club moved back to Little Sabine Bay in a small space over the bar in the newly built Banana Bob's, which was later destroyed by Hurricanes Erin and Opal in 1995. For the next three years, PBYC’s home was “adopt a bar” until a long-term lease was signed in 1998 with the Sabine Marina to rent 1100 square feet in their new building with a deck that offered sunset views of Little Sabine Bay. Ironically, Sabine Marina is located on the former site of The Marina, which was burned down by a lightning strike during a thunderstorm in 1995. PBYC remained at this location until April, 2015 when the lease ended and the members went back to the “adopt a bar” format while waiting for completion of their new clubhouse on club owned property. For a modest yacht club, PBYC has held its own among the other larger, more established members of the Gulf Yachting Association (GYA). The club has its distinctions as well. Member Ellen Hunt founded the Race for the Roses, an all-women sailboat regatta which evolved to become the GYA Women's PHRF Championship. PBYC has won significant regattas including the annual Navy Cup (yacht club vs. yacht club); and Challenge Cup (club teams vs. other club teams). Individual members too have won numerous regattas -local, regional, and national. We even count an Olympic medalist among our members. In 2002, then Commodore Al Greene, writing in the club's newsletter The Spreader, described PBYC as "The Best Little Yacht Club on the Gulf." It was true then, and it is true today. The club prides itself as a leader in social innovation and its responses to social change over time-- evidenced by its earliest history of creating opportunities for members to meet when there was no clubhouse to today's diverse membership eligibility that has kept pace with changes in the attitude of the contemporary community. History opened another chapter in January 2015 when PBYC bought a sunrise-facing waterfront property on Pensacola Beach Blvd. The club's first permanent clubhouse is expected to be completed by summer 2016. A 36-year dream is about to be realized, and this is just the beginning.